ABC is ready for more laughs. Today, the network announced they’ve renewed America’s Funniest Home Videos for the 2018-2019 season. Hosted by Alfonso Ribeiro, the long-running variety show features funny, homemade videos submitted by viewers. The series is currently in its 28th season. America’s Funniest Home Videos has certainly dropped in the ratings since it debuted in 1990, but it’s still a staple for ABC. So far, season 28 is averaging a 1.00 rating in the 18-49 demo and 4.977 million viewers. Not bad for a nearly 30-year-old show. 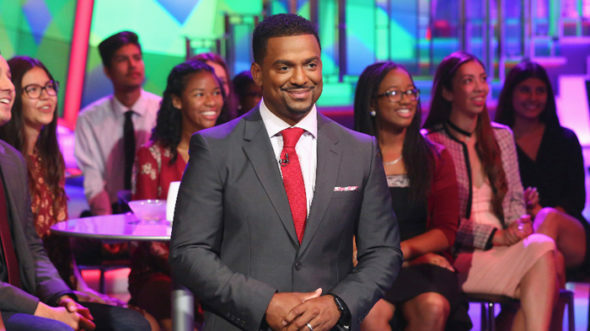 Hosted by Alfonso Ribeiro, “America’s Funniest Home Videos” is the longest-running primetime entertainment show in the history of ABC. Each week, the AFV team evaluates thousands of user-submitted home videos to bring you America’s real-life funny moments captured on video. “AFV” offers a weekly $10,000 first place prize to the funniest or most unique video as voted upon by the in-studio audience. Those prize winners then move on to the next competition round where they vie for a $100,000 prize. At the end of the season, the $100,000 prize winners compete for a grand prize vacation package. In its 28 seasons to date, “AFV” has given away over $15 million in prize money and evaluated nearly 2 million videotapes from home viewers. ABC’s broad-appealing “AFV” is the No. 1 show in family co-viewing on the major networks this season, with 31.4% of the show’s Adult 18-49 viewers watching with a Teen 12-17 and/or Kid 2-11 present. What do you think? Do you watch America’s Funniest Home Videos? Are you glad it’s been renewed? More about: ABC TV shows: canceled or renewed?, America's Funniest Home Videos, America's Funniest Home Videos: canceled or renewed? Love watching AFV! Want to enter my kitty video, haven’t seen one like it!